We love Thursdays (because they're almost as good as Fridays) and today is even better because I'm so excited to be sharing Homespun Signs in this week's Best of the Nest series! April is all about creating a dream home and nursery and Homespun Signs makes beautifully crafted rustic wood signs of all sorts. 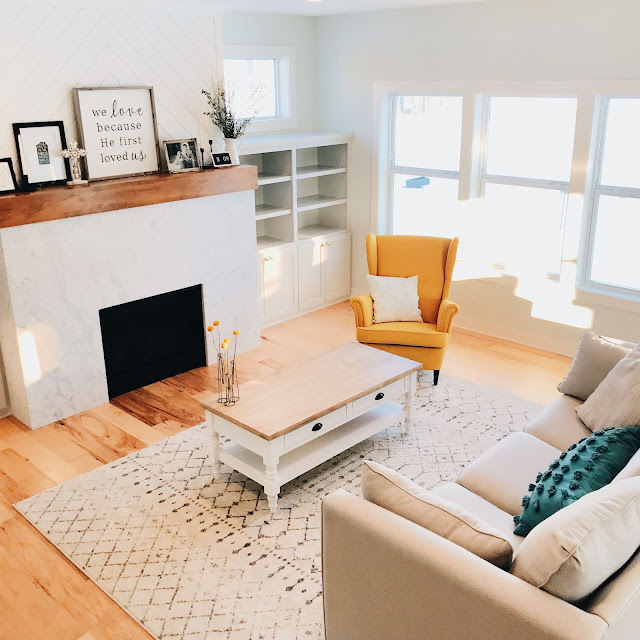 Owned by beautiful Mama of 4 Stephanie, Homespun Signs was started out of her love of creating unique decor for her own home and after catching the eye of all her family and friends, it quickly grew from there. Now Stephanie offers a wide variety of the most incredible signs, including custom pieces, large and small ones and more! 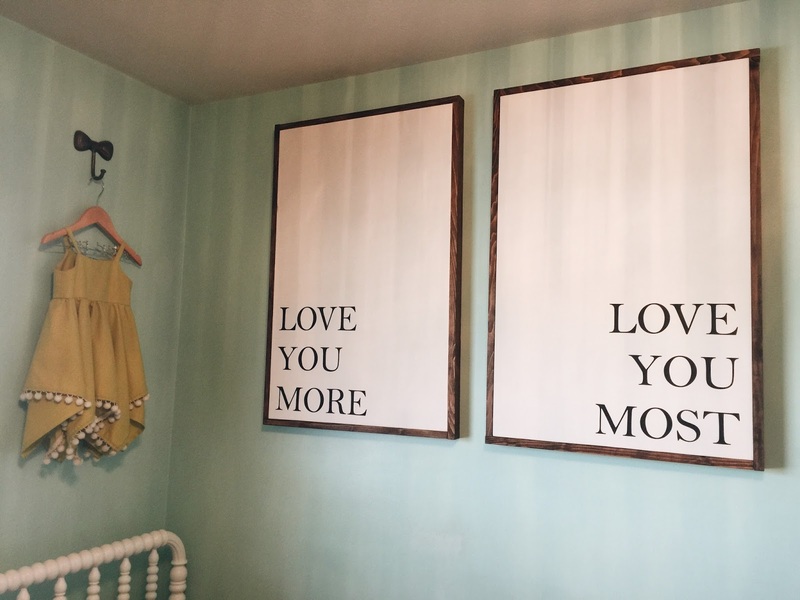 This beautiful set of love you more / love you most signs from Homespun Signs hangs above Olivia's bed. She is all about spelling right now so more often than not I find her standing and pointing out each letter as she spells the words one by one. My first baby and forever melting my heart. There are so many things I love about these signs but this set in particular, I especially love their grand size. They are perfect for making a statement in a room and they're so versatile. They would be lovely in a child's room, in a nursery hung above a crib, a master bedroom, anywhere! And Stephanie offers the option to buy them individually or as a set with a little extra savings. Over the past few years since we got married, Dustin and I have really spent a lot of time transforming our house into a home. Being our first home, it marked the start of a new chapter for us when we bought it and moved in. It's been the house we went home to after we said "I do," the home we brought both our baby girls home to, the home we've laughed & cried in, shared meals, invited loved ones into and filled with many special memories. This set of signs is everything this house is about: love. They are a constant reminder that we can never love our babies or each other too much. A reminder that no matter what the day is like, no matter how tired or worn out I am, I can choose to love. 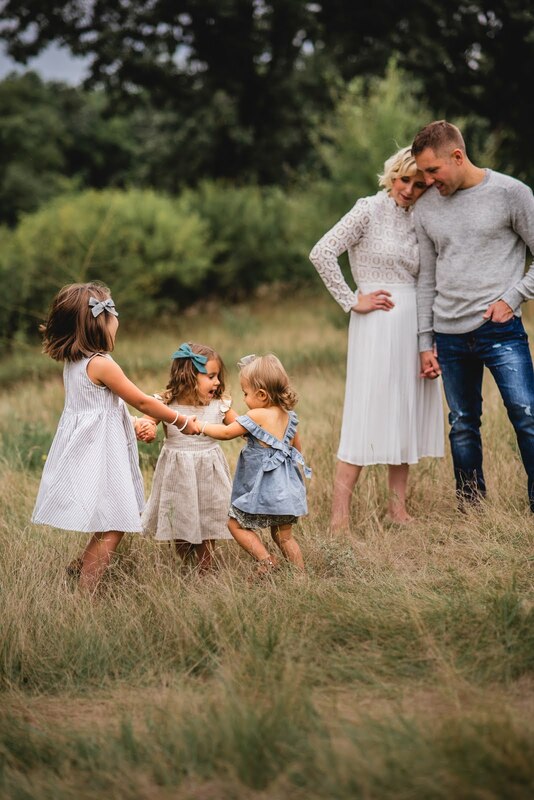 Because having this family to love is such a gift. 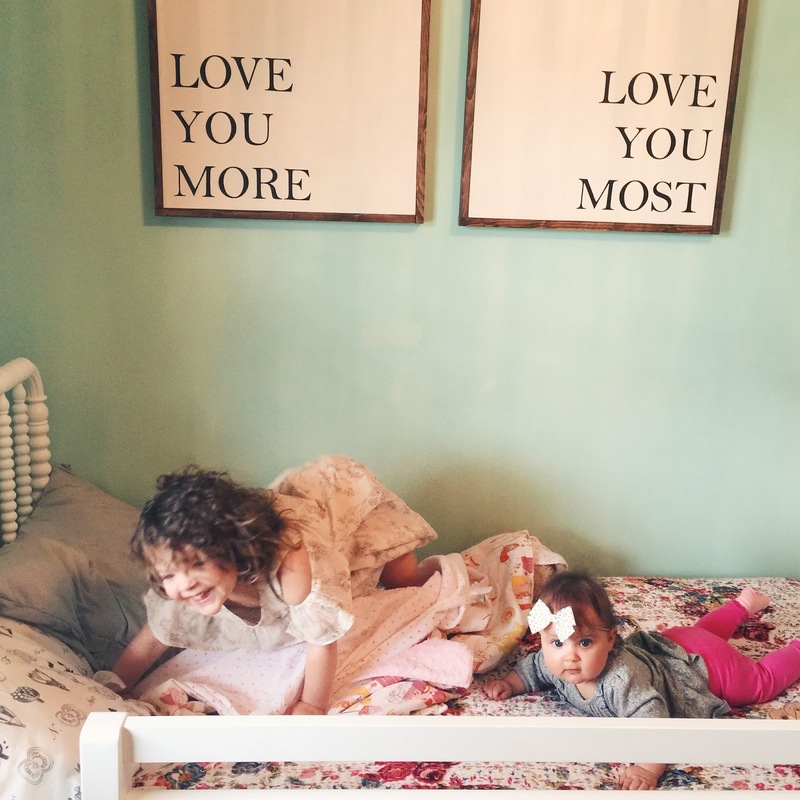 We spend a lot of time in each of the girls' rooms during the day and Olivia's bed has quickly become the spot to gather before nap time with piles of books, always snacks in hand and lots of blankets as well as her beloved teddy bear. Poppy mostly just lays and watches as Olivia jumps, reads, spells, you name it. Taking it all in and watching her big sister's every move. 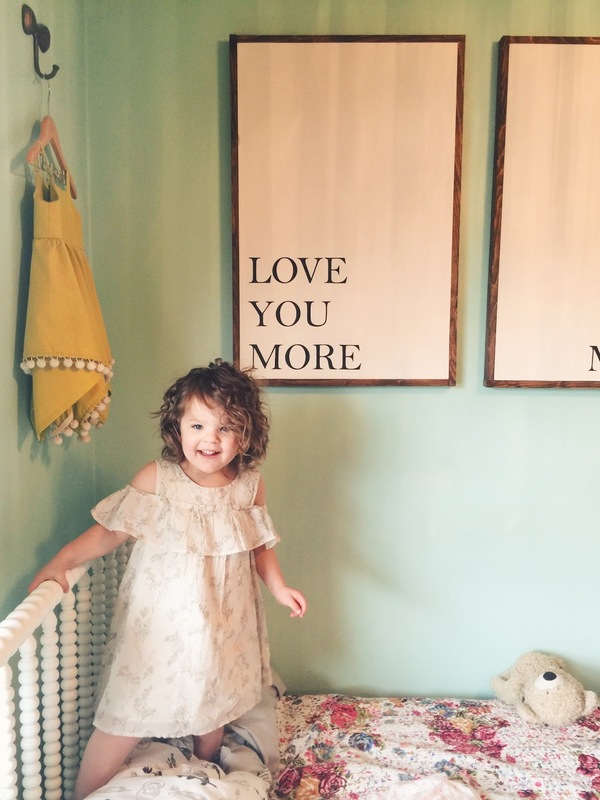 I love that these signs hang above her bed because so many of my best memories with my two little girls are made in that room. In addition to the set we have, there are so many I just love! For our next baby I've already decided a custom name sign is at the top of my list for designing a nursery. So so sweet. I absolutely love this black background + white "delightfully chaotic" sign and the created for this moment sign is another favorite. And because we love these signs so much (and every other sign in her shop! ), I've teamed up with Stephanie to give away a $50 SHOP CREDIT to one of you to pick out your own favorite sign! 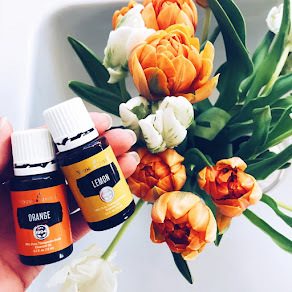 Head over to my instagram @blessednestblog to enter! Hope you all have a wonderful rest of your week! 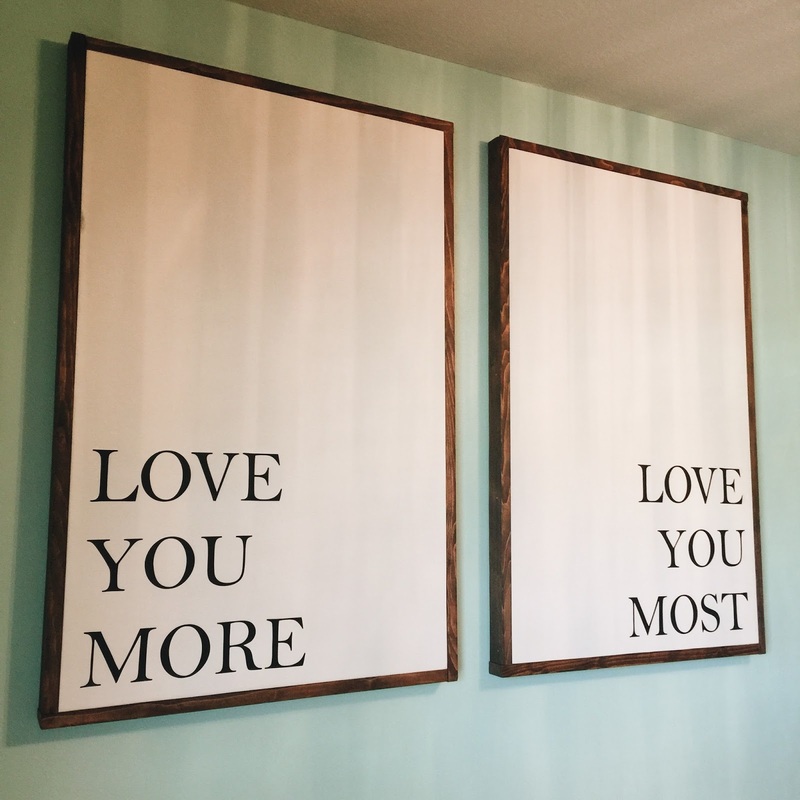 The 'love you more' 'love you most' signs are my fav as well! Nobody got a you like me is my favorite! I love these two signs they are my fave! My husband and I say this to each other! Would love these for our anniversary! The mini little house sign is a favorite of mine because it represents all of the reasons why we chose our forever home!! We have a little capecod that is surrounded by enormous grand homes that makes ours look like a doll house. And I wouldn't have it any other way!! The sign with the verse in Joshua is my favorite. We have that in our current living room, as a decal. We're moving this weekend and I am so sad we wont have that in our new home. I was talking to my husband and we want to invest in a piece with that scripture that we can take with us wherever we go. We pray that over our family constantly and it's a proclamation of our hearts. I love the custom name sign for my little girl. I love the custom name sign! I am pregnant with our 4th baby due next month (and last) so it's bittersweet decorating a nursery for the last time. especially since it's been a rough road getting this little lady here. I would love to hang that sign above her crib!! My favorite is her "Perhaps This is the Moment You Were Created For" sign. LOVE! The Love you more Love you most signs are definitely my favorite but her custom name sign is beautiful too! I love the custom name sign, but would have to go with the "love you more/love you most" because it would be sooo perfect in my nursery!! AHHH dying!! These are so perfect. I actually love this Love You More/Most set the best. We finally bought an actual bed frame (after 5 years of marriage and a metal frame) and these would be perfect to round out our master bedroom. 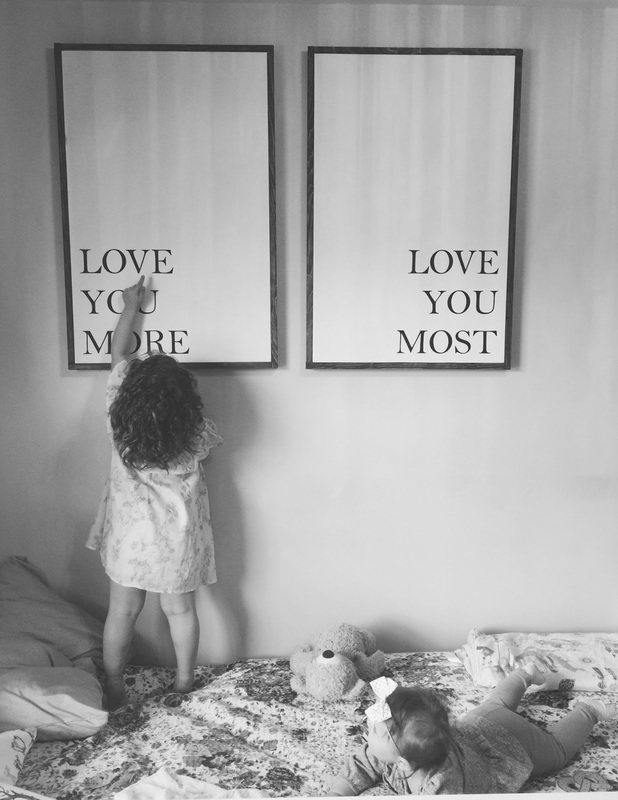 The love you more, love you most set is my favorite!!! I love this set most! My son and I go back and forth with "I Love YOU More"